Are you having an interreligious or interfaith marriage? Oh, how we love those cross-cultural weddings that exude that fuzzy feeling of love in every frame. With families openly accepting interreligious marriages today, fusion weddings are on a rise. Once you’ve decided to tie the knot or exchange your wedding vows, ensure you’ve discussed important topics such as differences in your faith, finances, etc. It’s very important for you as a couple to understand what you’re getting into. After you have a clear picture in your mind regarding your future, it’s time to break the news to your family. Do not, we repeat, DO NOT include your families when you’re half way through your wedding planning stage. Involve them right from the beginning. Ask for advice on how you can amalgamate the two diverse religions to have the best fusion wedding. Get their consent on certain rituals that need to be performed and keep the communication process open. However, if you want certain ceremonies to be done differently, ensure that’s communicated too. When discussing your plans, be prepared for responses from the elderly such as “This is not how we would do it” or “During our olden times.” Initially, your family and relatives may find things weird, but gradually they’ll come around it. If it takes a little bit of compromise to have your wedding run smoothly, do not hesitate to step down. Instead, have fun exploring something new and try to incorporate (not force) your traditions and rituals in the best way possible. 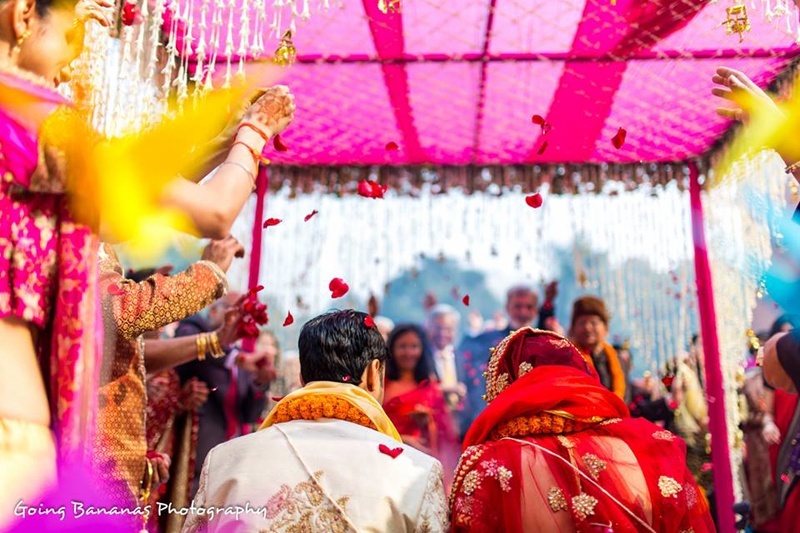 For instance, if you’re living abroad and cannot have a traditional Indian wedding, incorporate certain elements of Indian traditions in your Catholic wedding. Giving out fusion wedding invitations, wearing fusion sarees or fusion gowns, decorating the venue in Indian style or giving away Hindu wedding favors are just a few examples to make your multicultural wedding interesting. Sit down with your families to discuss which ceremonies from both sides can be performed jointly. The purpose of doing so is to cut time, so make sure they don’t run too long. Despite the countless suggestions you get from your family members regarding the ceremonies, as a couple, you decide how you would love to celebrate your union. Some couples opt for a 2-day event; wherein, they have a Hindu wedding on day 1 and Catholic wedding on day 2. Bollywood’s cutest couple Riteish and Genelia Deshmukh got married with this idea. Alternatively, you could opt for a 1­-day event with a Hindu wedding ceremony in the morning, a Catholic wedding early evening, followed by a reception. Though this can make the schedule too tight for the couple and get too tiring for both the parties involved. Fusion weddings generally attract a high number of guests. However, you decide who gets your fusion wedding invitation. Your parents might insist on inviting all the ‘duur ke rishtedaars’. It is at this point you put your foot down and let them know if you can’t afford the extra cost of inviting them. If your parents still insist saying your relatives invited them to their son’s or daughter’s wedding; be polite and request your parents to cover up the extra cost if you’re bearing the entire wedding celebration expense. An alternate way of giving out invitations to guests would be inviting selective guests for all the functions, including the pre-wedding functions and dividing the invites of other guests of which some get invited only to attend the ceremonies and others just the reception. If you intend to incorporate all the religious functions just because you do not want to miss out on any cultural element in your wedding, then ensure you have more time and a flexible budget. If you’re the kind of couple who doesn’t want to include many rituals, then we’d suggest you keep it simple, short and sweet. As fusion weddings tend to double the cost that is estimated for general weddings. Give cross-cultural options of food and music to your guests. With fusion cuisine gaining popularity, this is the best possible way you could showcase how two cultures can effortlessly blend. As for the music, it could be a fun ice-breaker to dance to foreign tunes. If you can, convince your family members to join dance classes before the big day so that they can put up a fun show for the audience. While you plan your big day together with your families, keep your perspective clear. With many cultures and ceremonies blending, do not forget to add your personal touch to even the minute things. If you or your families are too busy with work and other commitments, finding it hard to commit to wedding planning preparations, hiring a wedding planner is a good option. It will surely increase the cost but will also be worth it since the stress of having everything perfect on your big day will be off you. Give it a thought. Have a look at our ideas and inspiration section to plan your fusion wedding better.